Frosted glass never seems to go out of style. This tried and tested glass not only offers a solid sense of privacy but also adds character and stylistic appeal to a building. You might have to pay more for authentic frosted glass but the investment will certainly pay off. If you are considering installing frosted glass, read our quick guide to help you make an informed decision. Frosted glass is a type of glass made opaque through the process of acid etching or sandblasting. Both processes help to break up and scatter light passing through glass thereby creating fuzzy visibility. Acid etching entails the use of hydrochloric acid to create varying levels of opacity on the glass. Etching lets you create a variety of decorative patterns and allows the use of different colors to customize sheets of glass. Sandblasting entails forcefully applying sand on the surface of the glass to make once transparent glass sheets beautifully opaque. Like etching, sandblasting allows for the creation of striking patterns that enhance the glass’s aesthetic appeal. Many types of frosted glass are available in different textures and patterns depending on your preference. 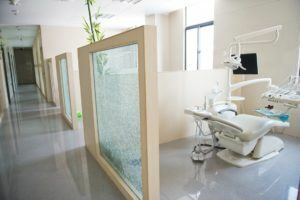 Common types include patterned glass, ribbed glass, water effect glass, and customized frosted glass. Some frosted glass sheets feature magnificent patterns and geometric shapes for a contemporary feel. From flowers to abstract patterns, geometric shapes to classic decorations, patterns give frosted glass a sense of style, character, and above all, privacy. Consider patterned frosted glass for front door entryways, special rooms, or for decorating a centerpiece window while prioritizing privacy. Some frosted glass doors or windows feature thin subtle ribbing on the glass sheet for low visibility glass. The vertical ribbing gives the glass a clean, minimalist and modern aesthetic appeal. Ribbed frosted glass is ideal for a contemporary front door or interior divider wall panels. Locations such as shower rooms, urban cafés, and high-end dining areas can benefit from lightly frosted glass. Frosted glass decorated using water-like patterns delivers a cool appeal that easily lets in natural light. This type of glass mostly features raindrop or bubble patterns that mimic a water-like appearance. Manufacturers can decorate glass using personalized effects and patterns depending on your preferred level of opacity and functionality. Admittedly, frosted glass is a significant investment whether you install this type of glass in the shower room, patio, or front door. However, etched or sandblasted frosted glass confers several benefits that deliver value. Sometimes, your interior spaces may not benefit from traditional blinds for privacy. If blinds are not an option, consider frosted glass panels. Fortunately, you can select the level of opacity you desire to meet your privacy needs. Unlike plain glass, frosted glass blocks a significant amount of light from entering the house and in cooler months keeps the cold out. Frosted glass will assist you with maintaining optimal temperatures inside the house all year long. Frosted glass is highly functional. You can install decorated or subdued frosted window panels in just about any location in your home. Additionally, frosted glass easily blends with diverse architectural styles and interior décor settings. If you are looking to decorate your home using frosted glass, proper selection and placement of the right glass can all seem a bit overwhelming. However, with a little help from an experienced vendor, you can achieve the perfect balance between privacy and stylistic appeal. At Fischer Window & Door Store, we believe you deserve the best quality windows and doors. Call us today, tell us the glass material you need, and we will prepare it for you.